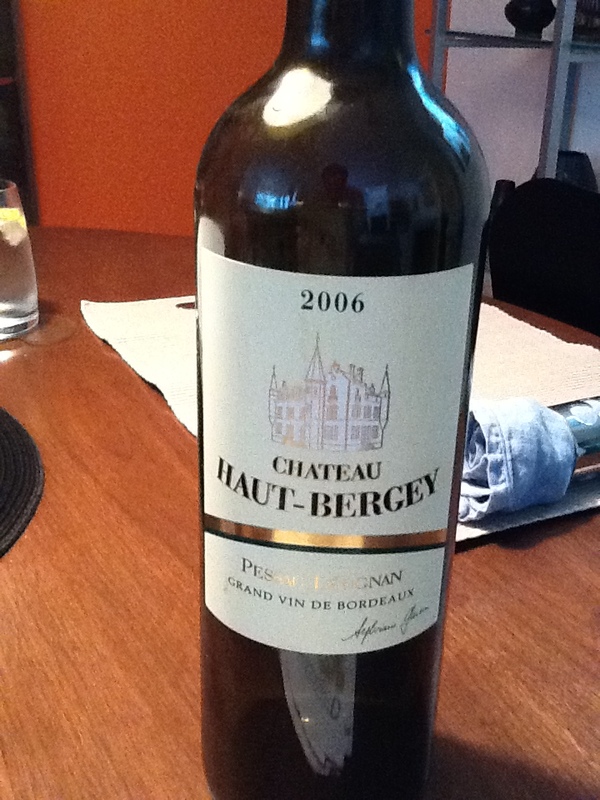 From the cellar: White Bordeaux. Sounds like an oxymoron. Even the more eloquent Bordeaux blanc sounds like a misnomer. And it comes at a steep price to boot. The day I bought it, the white next to it was Chateau Smith-Haut-Lafitte, a mere $299 (seriously) with aging potential according to the “specialist” on duty to 2024. Maybe in 2024, after all the European banks collapse, it will look like a bargain? Without much context to compare it to, except a brilliant bottle of Pavillon Blanc I had the rare opportunity to drink a few decades ago, the finer white Bordeaux’s are out of my price range and out of my reach. But this was pleasure all round, if you like a fulsome white. The HBB is sturdy, crisp, tart with a minerally undertone and an almost perfect balance of “just enough” oak. A masculine white; think Lee Marvin in Point Blank masculine. What I imagine the very good Aussie Sem-Sauv blends aspire to be, but sometimes end up more Mark Wahlberg in The Fighter. With food it went well pre-dinner; we had Marcona almonds, some olives and charcuterie. It held up well with a gorgeous finish. It was strong enough I think to complement any number of meats. However, for a main we had a delicious cheese souffle and (my mistake) this needed something gentler and more floral. I should have pulled out the Huet Vouvray Petillant, but what was done was done. Market Liquidity: Wonderful. Just not, price wise, twice as good as new world Semillon / Sauvignon Blanc blends. A mostly Merlot blend that is extremely easy to drink although without the defining characteristics that make LN41’s varietals so exacting and exciting. [This blog is littered with L’Ecole plaudits: Merlot, Chardonnay, Semillon, Chenin; too bad we didn’t do a handstand with this one.] It seemed to me an ideal social wine, a BBQ wine, where you could have six bottles on hand and no one would complain, but no one would care, really, either. For us not something special, unique or interesting enough to include in our duty free allotment next trip south. Price: $18 in Washington, hard to find in BC (their varietals are $35-55). Market Liquidity: Good for good friends. The archetypal California chard. Laden with butter, oak, deep earthy caramel and zero citrus. Too heavily oak-ish for some but it drinks as you would anticipate, and expect, on a warm summer evening in Healdsburg. In other words simple, appealing, without pretension. It certainly didn’t bring the house down but we got through a bottle in no time. Price: Under $20 in WA. From the cellar: Ambiguous and alluring. Exquisite and exciting; sort of like a trip to the Louvre and seeing something old for the first time. Contradictory—sweet but not, strong while gentle, assertive while delicate—and intriguing: A floral nose but not a bouquet on the mouth; it reminded me of once taking a bus across Crete in April and that exceptional scent in the hills when the lemon trees bloom. Sweetness on the tongue but a dry wine. Citrus, sort of like lemon rind, but not biting or detracting. Superbly interesting and evocative and nothing like the everyday whites that dominate our liquor store shelves. 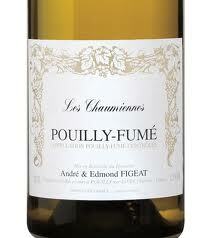 Will Chenin Blanc become the next Riesling? Probably not; CB is more like a Rubik’s cube while Sauvignon Blanc and Chardonnay are, at their best, a Saturday NYT Crossword. Price: $34 at Marquis but at least a year ago. 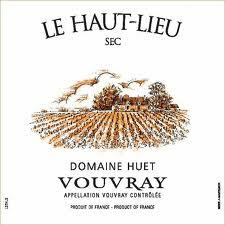 Market Liquidity: If Harold Pinter had made wine it would have resonated like this Huet. Critic’s darling. Mr. Parker gave it 90 points; collar on the neck. Local reviewer Anthony Gismondi echoed that with 90; hand-written note in the store. Wine Access best buy sticker on the neck. And so on. But I can’t help but feel this is a bit like the critics who liked Clooney in The American. It was a visually stunning bomb and it may have thrilled the jaded critics who sit through a panoply of dross, but it’s was just an OK not-that-exceptional red at a very good price point for us. A blend, but mainly malbec, it sipped quite nicely and fresh from the bottle without air had a deep, smoky, spice nose and bite. Funnily enough, though, if I hadn’t seen the collar with ROBERT PARKER 90 POINTS, I would have pegged it at a mere 88 points (whatever the heck that means). Worse, though, it was not food friendly. We drank it with two dinners, a meat based pasta one night and a homestead beef chili with corn bread the next, an on neither occasion, when a malbec would normally wow, was it as suave and elegant as on first sip. With food it became somewhat sour, chalky and bitter. It may well be the most pleasing value red on the market for some, but we’ll pass on buying it again, regardless of the plaudits. I am extremely tolerant of mediocre wine and slow-moving movies—hey, I sat still through all 104 minutes of The Scent of Green Papaya without any qualms—but there is more wine, and better wine, even at this price, to settle. Oh: And reviews are subjective. I count myself. Market Liquidity: Doesn’t play in Peoria. Delectable. In a one-two-three punch of west coast chardonnays this week (L’Ecole No 41, Cambria and CSM’s Ethos) this is the hands down winner. While L’Ecole was the most impressive, in terms of artistry, it was sort of like fine china out to impress the in-laws, and the Cambria had fine structure, although it was more like a great off the rack blazer. The Ethos, however, well there was just no faulting the CSM, which seemed to marry haute couture with enjoyment on the midway. It has a buttery floral nose, surprisingly smooth with a honey lemon finish. Aperitif perfect, light, despite is amber hue, and no qualms as a dinner date (with a vegetarian casserole, base of bulgur, filled with sautéed zucchini and onions, topped with feta, cottage cheese and three year old cheddar). True, it wouldn’t stand up to some of the Burgundies that made our time in Beaune so incredible but it shows how exceptional wine out west can be (and, keep in mind, we thoroughly dissed the Horse Heaven sauv bl, so for us this was redemption, thank you CSM). Spectacularly well balanced. And, thank goodness, not as uber-alcoholic as the other two, although still on the studly side. Price: $22.49 USD; not available in Canada, although their everyday chardonnay sells for the same price (as the Ethos) in CDN in private stores. Market Liquidity: Drop dead gorgeous. First of all, the grand poobahs of the wine review establishment (you know who you are) need to get off their collective tushes and take a stand on high alcohol. Maybe they’re for it; maybe they like getting drunk on table wine that is essentially fortified and an inch away from spirits. Or maybe they don’t. And if they don’t they should have a system, say points lost for high alcohol since they’re so headstrong about points. How about, for white wine, a one point demerit for every percentage point over 14 per cent alcohol? It will never happen because in the big leagues they are part of an industry, not a living human being enjoying wine. We are however after-tax-paying-wine-customers, actually why the industry exists, and as with many wine drinkers we’re partial to quality wines under 14 per cent which are, at least in North America amongst the wine cognoscenti, out of fashion. The Cambria was a dupe. 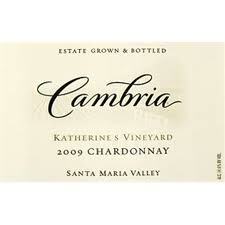 You will need a magnifying glass to ascertain the alcohol content on the Cambria. It’s in about a four point font and, even more irritating, it’s vertical. But I will save you the hassle of figuring out whether it’s 14.4, 14.5, 14.8: It’s a whopping 14.6%. I mean you might as well call it sherry. OK, all that aside, this is a perfectly lovely everyday chardonnay. It has good balance, is quite buttery and has a complimentary citrus bite. Although not deep on the finish it has a wonderful typically chardonnay character on the palate and, in terms of flavour, it was oaky but restrained, just plain old good drinking. With food (carrot, dill, feta risotto) it was a surprisingly good foil, especially when my go-to wine with that dish is a Sauv Bl. I would say “highly recommended” except for the alcohol content which is, given how many exceptional California chards there are at 13.5 per cent or less, over-the-top and not in a good way. 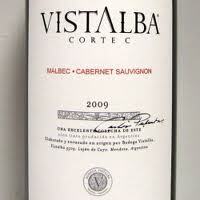 Price: $18.50 USD, not available in BC (although their pinot can be found in private stores for $42). Market Liquidity: Basically a semi-automatic when a simple revolver would have done the trick. Golden in the glass. An unusual floral note in the stemware (heightened if all that’s clean is a Montrachet balloon as opposed to a Chablis glass. Oh, remind me to put the dishwasher through…). A deep and resonant bite with a pleasing long finish. The west coast chardonnay style done up and done right. 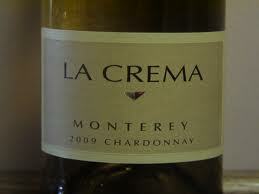 In fact, I was stunned that chardonnay this good came from Washington and not further south. A good contrast would be the Ghost Pines we tasted a while back. It was as though GP was trying to achieve what L’Ecole hit with aplomb. Oaky though. Oak forward. Shirley won’t pleez some of the wine cranks. But even for us a tad too much oak. And, unfortunately, an extremely unappealing 14.5% alcohol. Why, why, why so much alcohol? That’s a white wine bummer and while we loved this wine I am probably going to defer to other less alcoholic options in the future. With food an interesting butterscotch, a sort of burnt caramel flavour came forward; delicious to the point of being decadent and a flavour not on the palate as a pre-dinner quaff. Price: $24.99 USD retail in Washington on a recent US trip. In Vancouver, their semillon is $35 and their reds over $50 and based on the alcohol content I would pass even if it was on the shelf. 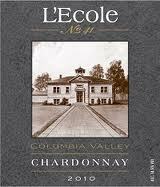 Market Liquidity: When you find a crap L’Ecole send me a text. A tart green grassy mouthful but slightly brash. A tad reminiscent of Taveners Sour Lemon Drops. Lingers on the tongue with what seemed a hard undertone (compared to, say, the softness of a gewurtz). With dinner (fresh halibut baked in a parchment packet with zucchini, cherry tomatoes, shallots and wine alongside sautéed criminis and fingerling potatoes) it was much more palatable, had a refinement completely missing as an aperitif, less zing, and in a good way. Overall, superb value if just an inch too forward. Market Liquidity: HS honour list but no scholarship. Imagine picking up a decent French white for around $20? Even though Ontario has high taxes, they’re still lower on liquor than BC. And it astonished me how much choice there was in the good old LCBO during a recent stay in YYZ. The Figeat has a well developed deep and appetizing flavour, a herby note (tarragon? ), straw tones, long finish, citrus crisp and bone dry. A pleasing taste although a tad bit of harsh metallic taste lingers on the tongue, it was, still, immensely enjoyable. No 92 pointer but nothing to rue either. Market Liquidity: Like a bargain bottle at Nicolas in Paris.